stamped onto kraft paper and left it uncolored (well almost)! and our wonderful sponsor this week is Little Miss Muffet Stamps. 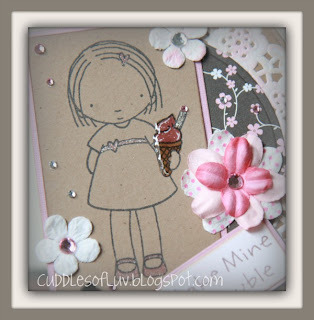 For my tag project, I used a MFT Pure Innocence sweetie, and stamped it on kraft paper (first time!) and colored only tiny bit of her outfit and the ice cream cone, with some white highlights. Added a bit of sparkle and shine to it too. Little bit of gem and flowers, and ribbon atop. VOILA... watcha think? The back isn't finished, so I could easily add a message, or even put a little pocket for a gift card. 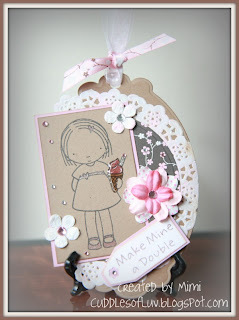 Okay... now hop on over to the LC blog and see more gorgeous tags from my team mates! and get all the deets to join in on this week's fun! so cute. love the paper and the details are wonderful! thanks for the inspiration! have a wonderful week! Beautiful tag! She looks great uncolored...still gotta try that! Love all the other details! Aww, this is adorable Mimi, a very sweet and colourful tag! Oh this is super cute. Love all the details. Fabulous tag Mimi! Love all the girly details. That ice cream cone looks yummy! Gorgeous tag. Hope you enjoy the rest of your week!